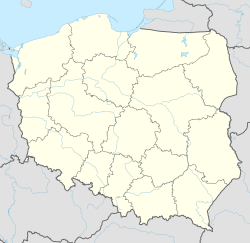 Czerniejewo [t͡ʂɛrɲɛˈjɛvɔ] (German Schwarzenau) is a town and municipality in central Poland with 2,536 inhabitants (2005). It is situated in Gniezno County, in the Greater Poland Voivodeship (since 1999), previously in Poznań Voivodeship (1975–1998). Czerniejewo is located on the Wrześnicą River, in a predominantly farming area. It is 15 km from Gniezno, and 12 km from Września. The earliest mention is in 1284 when the town is referred to as Handeslplatz. It was a royal possession from then until 1386 when King Władysław Jagiełło gave it to Sędziwój Pałuka z Szubina. At that time the town already had the right to hold markets. By 1390 the town had full Magdeburg rights. In 1581 King Stefan Batory granted the town the right to hold trade fairs. From 1594 to 1644 the town was known as Czarnkowskich and from 1644 to 1726 as Opalińskich z Bnina. In 1771 General Jan Lipski began building a palace, adjacent to the town, which was completed in 1780. In the second partition of Poland Czerniejewo went to Prussia, and was called Schwarzenau. From 1807 to 1815 it was part of the Duchy of Warsaw and in 1815 returned to Prussia as part of the Grand Duchy of Poznań. Schwarzenau was connected to the German railway system in 1875. In 1918-1919 the inhabitants participated in the large Polish rebellion, and the town again became Czerniejewo. In the Second World War Czerniejewo was occupied by the German armed forces in 1939 until in January 1945 the Red Army invaded. This article is based in part on material from the Polish Wikipedia. Wikimedia Commons has media related to Czerniejewo.